Fin handling is a unique subset of material handling that pretty much defines the challenge of manufacturing heat exchangers. An experienced heat exchange engineer once described handling fin like handling smoke and we certainly understand what he meant. One proven method for handling fin is Fin Pyling. These systems take on a variety of forms dependent upon the fin and the heat exchanger but they all result in an organized stack or pyle of fins that can be either stored or easily handled for further processing. Fin plyers work especially well for utilization with manual and semi-automatic core builders. They are designed to collect fin directly from the fin mill and process them into pyles that allow for easy loading into the matrix of the core builder. 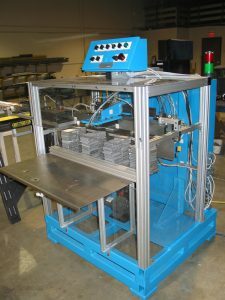 Systems can be designed for single or multiple pyles and can be stationary or allow for the delivery of the pyle to the operator. 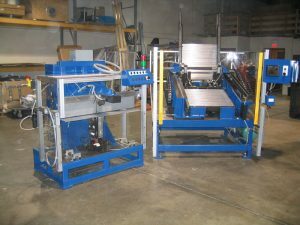 These systems serve as a very viable alternative to trayers for many heat exchange manufacturing applications.